We've seen a lot of utensil combinations through the years, from Sporks (spoon forks) to Knorks (knife forks) to Chorks (chopstick forks), but never have I seen utensils mixed with hand tools like these cool new DIY Set from Diesel by Seletti. 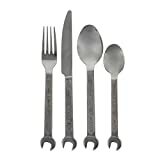 This handy flatware set includes a 18/10 stainless steel knife, fork, tablespoon, and teaspoon that have a convenient wrench on the end. Not sure if these are stored in the silverware drawer or tool chest. Makes a fun gift for any do-it-yourselfer who enjoys a little fine dining.